Well, after going to see the enjoyable but flawed Maleficent, it felt like the right time for a viewing of this classic. 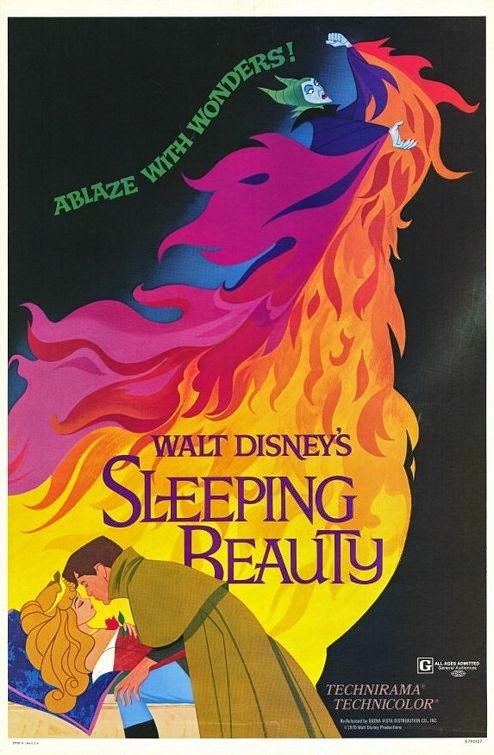 And this may surprise some, but this was in fact – barring, possibly, as a baby – the very first time I ever saw Sleeping Beauty. I’ve seen bits and pieces, of course – clips of Maleficent’s big entrance, that most persistent of earworms ‘Once Upon a Dream’, which rather makes me think Disney should lift melodies from great composers more, Prince Philip’s kiss of true love – but I am almost certain that this was the first time I’d seen the full film. The most exposure I had to Disney’s version of Sleeping Beauty has been through Kingdom Hearts: Birth by Sleep. It may be a result of this lack of experience, but I had a lot of misconceptions about the film, and honestly I think they’re pretty widespread. For one thing, with Aurora being part of a trinity of the most iconic fairytale princesses with Snow White and Cinderella, the film feels like older Disney than it really is. Sure, Cinderella is 1950 and Sleeping Beauty is 1959, the same decade, but for all the continued involvement of the Nine Old Men, the Disney of Alice in Wonderland and the Disney of Sword in the Stone feel rather different, and the difference is visible here, not least because there is a clear attempt at a distinct, stylised, sharp-edged style, especially in the opening sequence of crowds gathering for Aurora’s christening. Other misconceptions I had included that the main character was Aurora, or even King Stephan – really, quite oddly, the central figures of the narrative are the three fairies Flora, Fauna and Merryweather, who are also the only characters who really get any development. I was also under the impression that one of Maleficent’s main problems was that unlike this film, it shows Aurora as asleep for only a matter of hours whereas the real story has the princess sleep for a hundred years. In fact, the same problem exists here – Maleficent leads Aurora to prick her finger and fall into an enchanted sleep, which she remains in only for as long as it takes the fairies to free and arm Philip and get him to his love. I understand why this has been done – like many modern readers, the Disney writers clearly had a problem with the idea that the princes wakes when total stranger arrives and kisses her, which is hardly true love. Maleficent even dismissed the idea that two young people who meet once and are attracted to one another can be said to share ‘true love’s kiss’ a day later. All of which, of course, is more pleasant than the infamous older versions in which the prince impregnates the enchanted sleeper without her even knowing about it and accidentally wakes her by sucking on her fingers and extracting the splinter that had caused the enchanted sleep. Creepy, man. But from my point of view, even this very 50s view of romance seems creepy. Aurora is messing about with the cute woodland creatures, the owl and squirrels very much like those who will feature prominently in Sword in the Stone using Philip’s coat and boots to pretend to be a prince, and seeing this and chuckling to himself, Philip steps in and takes the place of the cutesy animals. Rather than screaming and getting out the mace, Aurora finds this charming and loveable. But the fact is that the romance, 50s or not, is functional and the plot still works. It is also tempting to be influenced by Maleficent and imagine that ‘Good’ King Stephan was actually a very nasty piece of work who had set Maleficent against him, and that Maleficent herself was sympathetic, but as I said in my review of that still-enjoyable film, one of its main flaws was that it had to write its own story rather than successfully managing to weave into the classic narrative. Thus the fairies were different and it was Maleficent herself who provided the ‘true love’s kiss’ get-out, and the ending was a complete departure. Intriguing as the reinterpretation was, the cartoon Maleficent is wonderful, easily one of Disney’s top villains – and they do villains so well. She is evil because that is her nature, not because of her twisted backstory. She turns into an awesome dragon, rather than transforming her henchman. Her scenes are not without humour – as when her minions reveal they have been looking for a baby for fifteen years. And her devilish, elegant, regal design is a thing of brilliance. Too bad Aurora and Philip are so bland – and I have real difficulty perceiving Aurora as just-sixteen when she looks 25. But again, it’s the fairies who are the film’s true centre, and they are very clearly defined, especially the likeable, fussy Merryweather. Diablo also gets remarkably good characterisation for a bird with a very minor role. It doesn’t feel Disney is showing its greatest strengths here. The musical centrepiece is Tchaikovsky’s. The animation, while fine, is less ambitious than it was decades before, with repeating parts and some lazy colouring. The story relies on a very brief love affair, bland heroes and a sleeping beauty who sleeps for less than a day. Yet it just about hangs together on its quirkier strengths, as well as the better-chosen borrowed parts. But it is less impressive than many Disney classics. (1) the story of the start of the curse: in this entire scene we never once see the baby. All we see is the cradle. So she really isn't a character here. (3) fulfillment of the curse: She is asleep and so is not doing anything. In short, the movie has a gaping hole in the center because the main character isn't even visible for most of the film. As you say, the primary characters are the three fairies; but since that is the case, the proper title of the film should be "The Three Good Fairies." The standout character is, as you state, Maleficent. This is someone who has not slept well for 16 years because she did not get an invite to a christening. You have to love her. So the real problem with this film is that while the animation is gorgeous, the story is very poor, so the film is really a failure. There is one thing I have noticed, which is that if your story is strong, it does not really matter how bad the animation is. Rocky and Bullwinkle is a great success because of the strength of the writing; the animation was done by a really lousy firm in Mexico. Absolutely - what makes a feature film stand apart is always, always the writing. Style without substance can only go so far, which is also why most sequels to animated films with half-baked storylines are considered so inferior. On the other hand, Sleeping Beauty remains fairly iconic and well-loved simply because Aurora is one of the archetypal Disney princesses - heavily branded and merchandised. There is a huge problem at the centre of the original story, really - the figure of the prince. He comes from nowhere and enters this relationship with a sleeping woman. Disney attempted to solve this by having him meet the princess beforehand, but this is both awkwardly done and means we lose the 'asleep for 100 years' image which is at least a powerful one on its own. It's a very hard fairytale to adapt in a way that makes us sympathetic to the central characters, I think. But yeah, if you're just looking for a basic fairy tale with nice animation and don't care about strong characterization and a sensible plot, then it's pretty good. As you said, it's iconic at least even if a lot of its elements are dated nowadays. Merryweather is very endearing! And of course Maleficent counts amongst the fairies and she's amazing. But judging from the reviews at the time, it was considered poor in terms of plot and character even then - but has a set of well-loved images nonetheless.